The city of Ajmer was originally called Ajay Meru which in translation means "invincible hills". Located in the Aravalli ranges of south-west Jaipur, the city was founded by Raja Ajaypal Chauhan in the 7th century and was the capital of the Chauhan dynasty until the late 12th century. After the defeat of Prithviraj Chauhan to Mohammed Ghori in the year 1193 AD, the place was named as Ajmer and was ruled by several other rulers from various dynasties. Located at the heart of Rajasthan, Ajmer puts forth the best of natural beauty and is a well-known religious destination for the followers of Hindus and Muslims alike and attracts a large number of visitors throughout the year. The place is well known for the holy Ajmer Sharif Dargah which brings people from not only across the country but also from across the globe. Ajmer like most other destinations can be visited anytime throughout the year. However, the best time to visit the place is considered to be from the months of October to March as the weather remains pleasant during this time. Apart from this time, one can visit the place in the month of May where one can take part in the Urs festival when the entire town is in a festive spirit. By Air: The nearest airport is the Jaipur International Airport which is located at a distance of 132 km from here. The airport is well connected to the major airports across the country, such as Bengaluru, Delhi, Mumbai, Kolkata, etc., and to a few international destinations. By Train: The nearest major railway station is the Ajmer Station which is well connected to most of the major towns and cities across the country and across the state of Rajasthan. By Road: One of the best ways to reach the town is by road as the place is well connected by excellent roads which connect the place with the entire country. One can find regular bus services which operate to a number of towns and cities across the state of Rajasthan and to Delhi and other cities located close by. The total driving distance from Delhi to Ajmer is about 408 km which would take you about 7 h to cover via NH 48, the route takes you through Gurugram, Neemrana, Jaipur, etc. before reaching Ajmer. Take a look at the different routes through which one can reach the place from Delhi. If you opt for route 2, it would take you about 9 h to cover a distance of 452 km via the NH 248 A & NH 48. If your choice is route 3, then it would take you 10 h to reach Ajmer from Delhi after covering a distance of approximately 456 km via NH 334 B.
Jaipur is the capital city of Rajasthan and has always been considered one of the major tourist destinations in India and translates to "the city of victory". Jaipur along with the cities of Agra and Delhi are clubbed together to form the Golden Triangle, which plays an important role in the field of tourism around the country. 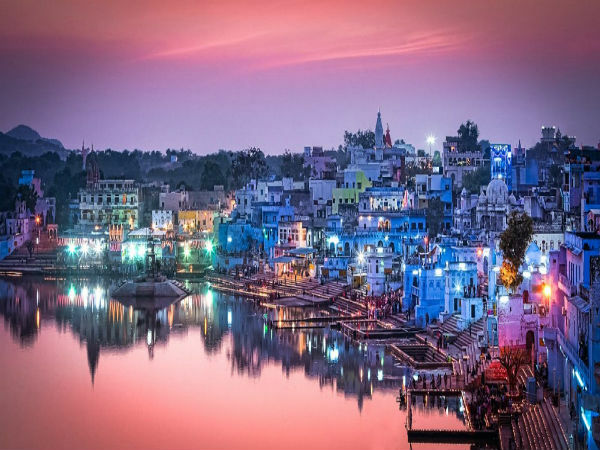 Established in the year 1727 by the ruler Jai Singh II, the place gets its name from this ruler and is considered as the first planned city of the country, which showcases a perfect combination of history with the influence of modernity. The major sights to see here are the Hawal Mahal, Amber Palace, Raj Mandir, Jantar Mantar, etc. The city is considered one of the best examples of secularism. Ajmer is a city where one would come across multiple religions, although, the predominant religions are Islam and Hinduism, which yet again stand as a shining example of secularism. The dargah is a Sufi shrine which houses the grave or maqbara of Khwaja Moinuddin Chisti. The shrine was built in the 13th century and attracts people of all faiths who come in large numbers to offer their prayers and get them fulfilled. The shrine is built entirely of pure white marble and has three gateways, the main gate is known as the Nizam Gate, the second one is known as Shah Jahan Gate, which was indeed built by him, and the third is the Buland Darwaza. Undoubtedly, the place is one of the most well-known pilgrimage centres in the state of Rajasthan. The Anasagar Lake is a man-made lake which was built by Arnoraj Chauhan sometime between 1135-1150 AD. The lake was named after Arnoraj, who was also known as Anaji. With the passage of time, the Mughals took over the place and Jahangir further built the Daulat Bagh Gardens close to the lake, which was later expanded by Shah Jahan after the construction of five pavilions between the garden and the lake.